یکی از روش های بررسی آسیب بافت، استفاده از تصویربرداری تشدید مغناطیسی است. در این نوع تصویربرداری از اثر مغناطش مولکول های آب و ماده کنتراست استفاده می شود. تبادل آب بر منحنی های مغناطش در پلاسما و بافت و در نتیجه بر زمان طولی موثر (T1eff) اثر دارد. برای بررسی این تاثیر از مدل های چندبخشی استفاده می شود. در این مدل ها معادلات مغناطش بافت برای زمان استراحت طولی ثابت در پلاسما حل شده و تغییرات زمان استراحت طولی در بخش های فضای داخل و خارج سلولی بررسی می شود و ثابت های انتقال در بافت محاسبه می گردند. زمان استراحت طولی بافت با مقدار ماده کنتراست در بافت متناسب است. تغییرات این ماده شبیه تابع گاماست. برای بررسی اثر مغناطش لازم است این تغییرات در معادلات لحاظ شوند که باعث پیچیدگی حل آنها می شود. در این مقاله با در نظر گرفتن تغییرات ماده کنتراست در بافت و با استفاده از شبیه سازی مونت کارلو و برازش منحنی و روش های عددی هیون، رونگه-کوتا و روش آماری، منحنی تغییرات مغناطش و زمان استراحت طولی در قسمت های مختلف بافت برای مدل های دو بخشی و سه بخشی بافت مغز موش به دست آمده است. ابتدا برای ارزیابی مدل آماری بر اساس قانون بقای جرم، محاسبات به دو روش عددی و آماری انجام شده و نتایج مقایسه شده اند. نتایج مربوط به داده های حاصل از تصاویر، به روش آماری نیز به دست آمدند؛ زیرا در این حالت نیاز به برازش منحنی بر داده ها نیست و می توان از آنها به طور مستقیم استفاده کرد. با تغییر ثابت های انتقال بافت مجموعه ای از منحنی های مغناطش برحسب زمان تهیه شده و با مقایسه زمان استراحت طولی آنها با منحنی های به دست آمده از تصاویر، ثابت های انتقال بافت محاسبه شده اند. ثابت های انتقال بافت های ناسالم نسبت به بافت های سالم بزرگ تر هستند زیرا در این حالت نفوذپذیری و در نتیجه افزایش تمرکز ماده کنتراست و مغناطش در بافت بیشتر است. این ثابت های انتقال که متناسب با شدت آسیب اند می توانند در تشخیص و درمان مورد استفاده قرار گیرند. Magnetic resonance imaging (MRI) is a non-ionizing method for identification and evaluation of soft tissue lesions. Perfusion MRI evaluates soft tissues by measuring changes in magnetization of water molecules due to a contrast agent. To this end, concentration curves in the plasma and tissue are estimated by MRI and effective longitudinal relaxation time (T1eff) of the tissue was calculated. To interpret the results, the effects of water exchange on the effective longitudinal relaxation time should be studied. This work presents such a study in which the equations of two- and three-compartmental models of rat brain tissue are solved using Hion and Runge-Kutta numerical methods for different input functions and simulated by Monte Carlo method. Since the exchange of water and contrast agent among different tissue compartments is a diffusion phenomenon, Monte Carlo method is applicable. Results of the numerical methods were compared with those of Monte Carlo simulation. The results of the two methods were almost identical with a maximum relative difference of less than 1%. In this work, concentration of contrast agent in plasma is estimated from MRI of a rat brain tissue. This data is used in the Monte Carlo method to obtain T1eff and exchange rate constants. An advantage of our method is that T1eff is obtained from real data and not from the curve fitting method as commonly used. We derive concentration of contrast agent as a function of time in extravascular space for different constants (K). Then, the curves of simulated and real data were compared to obtain the exchange rate constant of each compartment. The results showed that K of an abnormal tissue was larger than that of the normal tissues. As such, this parameter may be used for diagnosis and treatment of the soft tissue diseases. Østergaard L., Weisskoff R.M., Chesler D.A., Gyldensted C., Rosen B.R., High resolution measurement of cerebral blood flow using intravascular tracer bolus passages. I. Mathematical approach and statistical analysis, Magn Reson Med, 1996; 36: 715–725. Lee M. C., Cha S., Chang S. M., Nelson S. J., Dynamic susceptibility contrast perfusion imaging of radiation effects in normal-appearing brain tissue: Changes in the first-pass and recirculation phases, J Magn Reson Imaging, 2005; 21: 683–693. Cao Y., Brown S. L., Knight R. A., Fenstermacher J. D., Ewing J.R., Effect of intravascular-to-extravascular water exchange on the determination of blood-to-tissue transfer constant by magnetic resonance imaging, Magn. Reson. Med, 2005; 53 (2): 282 293. Averill M. L., Simulation modeling and analysis; Mc Graw-Hill 1991. Li X., Rooney W. D., and Springer Ch. S., A unified MRI pharmacokinetic theory: intravascular and extracellular contrast reagents, Magn. Reson. Med, 2005; 54 (6): 1351-1359. Xu H., Xie J.-X., Li X., Yang Z .H., Zheng Z.-Z., Wang B., and Wang Z.; Perfusion-Weighted MRI in evaluating the intranodular hemodynamic characteristics of dysplastic nodules and hepatocellular carcinomas in an experimental rat model, J Magn. Reson. Imaging, 2008; 59: 102–109. Zhao L., Sukstanskii A. L., Kroenke D.,Song J., Piwnica-Worms D., Ackerman J.J.H., Neil J.J., Intracellular Water Specific MR of Microbead- Adherent Cells: HeLa Cell Intracellular Water Diffusion, Magn. Reson. Med., 2008; 59: 79-84. یاحقی عفت، سلطانیان زاده حمید، شهریاری مجید، فتورائی ناصر، تخمین نفوذپذیری از روی تصاویر تشدید مغناطیسی با استفاده از شبیه سازی عبور ماده کنتراست از سد خونی-مغزی آسیب دیده، نشریه علمی و پژوهشی امیرکبیر 1384، تابستان و پاییز: 47-56. 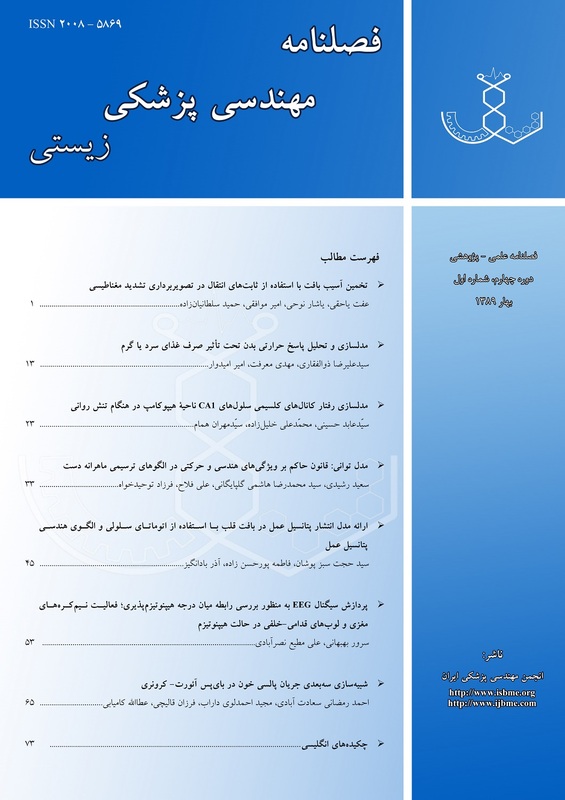 Yahaghi E, Soltanian-Zadeh H, Senior Member, IEEE, Shahriarei M, Fatouraei N; Leakage from blood brain barrier: Effect of injection profile on plasma and extravascular concentration, International Journal of Scientific Research (IJSR), 2006; 16: 217 221. Tofts P. S., Brix G., Buckley D. L., Evelhoch J. L., Henderson E., Knopp M. V., Larsson H. B. W., Lee T. Y., Mayr N. A., Parker G J M, Port R. E., Taylor J., Weisskoff R. M., Estimating kinetic parameters from dynamic contrast-enhanced T1 weighted MRI of a diffusable tracer: Standardized quantities and symbols, J. Magn. Reson. Imaging, 1999; 10: 223-232. Fournier R.L., Basic transport phenomena in biomedical engineering, Taylor and Francis, London, 1998. Strijkers G. J., Hak S., Kok M. B., Springer Jr. Ch. S., Nicolay K., A Three-compartment T1 relaxation model for intracellular paramagnetic contrast Agents, Magn. Reson. Imaging, 2009; 61: 1049–1058. Einstein A., Investigation on the theory of the Brownian movement; Dover, New York, 1926. Moran G.R. and Prato F.S., Modeling tissue contrast agent concentration: A solution to the tissue homogeneity model using a simulated arterial input function, Magn. Reson. Med, 2001; 45: 42-45. Zhao L., Sukstanskii A.L., Kroenke D., Song J., Piwnica-Worms D., Ackerman J.J.H., Neil J.J., Intracellular Water Specific MR of Microbead- Adherent Cells: HeLa Cell Intracellular Water Diffusion, Magn. Reson. Med, 2008; 59: 48-79. McCommis K. S., Zhang H., Herrero P., Gropler R.J., Zheng J., Feasibility study of myocardial perfusion and oxygenation by non-contrast MRI: comparison with PET study in a canine model, Magn. Reson. Imaging, 2008; 26: 11-19. مجذوبی غلامعلی، روش های عددی کاربردی در مهندسی علوم، انتشارات دانشگاه بوعلی سینا، 1384. Xu H., Xie J.-X., Li X., Yang Zh.-H., Zheng Zh.-Zh., Wang B., and Wang Zh., Perfusion-weighted MRI in evaluating the intranodular hemodynamic characteristics of dysplastic nodules and hepatocellular carcinomas in an experimental rat model, J Magn Reson Imaging, 2008; 27: 102-109.